President Donald Trump may have angered the Israeli government just days before his trip to the Middle East. There has been speculation that Trump would visit the Western Wall, the holiest site in Judaism, during his Israeli trip, which would make him the first sitting US president to do so. 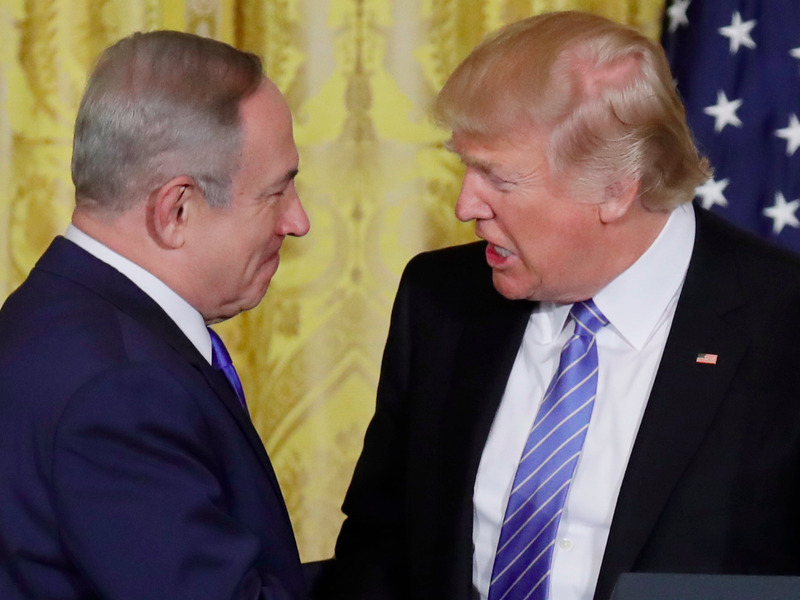 However, Israel's Channel 2 reports that while planning the visit, a Trump aide questioned Israel's control over the holy site, located in disputed East Jerusalem. Channel 2 reports, as noted by the Times of Israel, that a Trump aide then angrily told Israelis that the Western Wall was part of the West Bank, which is governed in part by the State of Palestine. "What are you talking about? It's none of your business. It's not even part of your responsibility. It's not your territory. It's part of the West Bank," said the White House official, according to Channel 2. Israeli President Benjamin Netanyahu reportedly wanted to accompany Trump to the Western Wall, a request the White House reportedly denied. Israelis also reportedly asked for a camera crew to film Trump, which prompted the American's remarks. An Israeli official told Channel 2 that the Trump team member's comment "was received with astonishment." Press Secretary Sean Spicer said the remarks were "not the position of this Administration," according to journalist Itay Hod. The Western Wall — also known as the Kotel — is the last remnant of the ancient Jewish Second Temple, and the closest that Jews can get to the Temple Mount, the holiest site in Judaism. The site has been politically controversial, as it is located in Jerusalem's Old City, which was under Jordian control from the founding of Israel in 1948 to 1967, when it came under Israeli control following the Six-Day War. In an odd coincidence, Trump's new Ambassador to Israel David Friedman arrived in the country the same day as Channel 2's report and made his first stop the Western Wall The reaction to Trump's reported visit to the site shows why sitting US presidents have stayed away from the Western Wall. The US president could now anger both Israelis and Palestinians with his visit. By Reem Hosam El-din -albawaba.com - A forecast report conducted by Colliers International for the hotels of the Middle East and North Africa (MENA) for the three-month period from April to June 2017 has showed that the UAE and Egyptian cities have experienced an increase in the number of reviews from Russian travellers who tend to view their stays in these cities positively. It has also showed that the key cities in terms of occupancy this summer are expected to be Beirut and Aqaba. In Beirut, an increase in revenue per available room (RevPAR) is expected to take place and emanate from both average daily rate (ADR) and occupancy rates, according to Colliers International’s report. The report expects Beirut to witness a busy summer season with high demand from the Lebanese diaspora living abroad. As for the Red Sea resort in Jordan, the report showed that it continues to benefit from the domestic demand and the demand from visitors of Scandinavian countries. Other MENA cities are steady in terms of hotel occupancies, such as Sharjah, where the hotel market in Sharjah is going through a recovery phase with modest growth in occupancies. “The upcoming Eid holidays and school vacations in the Gulf countries, followed by strong growth in the Chinese market, will keep the RevPAR in line with the rates of last year without declines,” the report said. 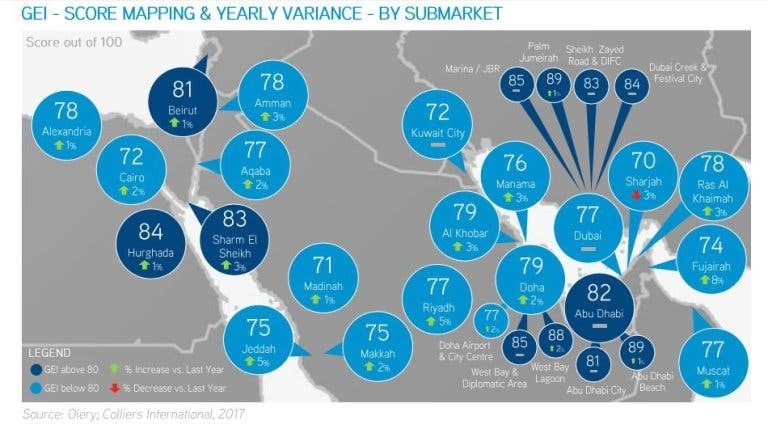 The return of summer heat and Ramadan is expected to lower the demand in Ras Al Khaimah; however, the strong local demand over Eid and school holidays, along with international leisure demand from Germany, UK, Russia, and India will keep the three-month RevPAR growth in line with last year. In Jeddah, both occupancy and ADR levels continue to decline due to a drop in demand by the corporate and leisure segments. “This is primarily due to the cuts in government and private sector’s spending, with little recovery expected in the medium term,” the report said. The market of Riyadh is also witnessing a downward trend in the performance of hotels. A combination of new supply and lower demand has resulted in a dip in RevPAR, which is expected to continue into the next three months, according to the forecast by Colliers International. Colliers International is a global company in commercial and real estate services with over 15,000 employees operating in 68 countries. She doesn’t like me to use my laptop while she’s speaking, let alone record, so I fidget notes onto a pad with one hand. She winces when she sees me doing this. “My life; my story — it’s nothing; look at what’s happening today.” Language gets in the way. Spanish is her mother tongue. Next came French. Then Italian, then Arabic. Her fifth language was English, acquired in her 40s, so a bit imprecise. Her story spans countries, conflicts, wars, and decades. The chronology isn’t the most important thing. Nor is the geography. The facts are blurred to begin with. What’s important is what remains. What triumphed. Her name is Encarnation Bayon. Mother of two, grandmother to three. Her life includes the most astonishing events: the Spanish Civil War and life in an orphanage; bigamy — hers; forbidden cross-cultural love; assassination of her prominent Jewish husband in Lebanon; fleeing, penniless with her children to Vancouver to start life over again. Encarna’s daughter, Marie Khouri, is a Canadian artist of considerable renown. She has just returned from an installation at the Crillon Hotel in Paris. Her work is largely informed by her mother’s remarkable story and intergenerational trauma. This story is about how, when we look at our mothers, all we see is the apron, when many of their lives conceal epics like Encarna’s. Survivor of some of the 20th century’s most catastrophic upheavals, she is a woman with a singular gift for living. “My mother had a big garden. I remember everyone outside, crying. We must have just had the news about my father,” says Encarna, whose father was one of the Republican dead, killed by Franco’s men in the waning days of the Spanish Civil War. He left behind a wife and nine children. “This is the way, the last moment, I remember of my family; crying.” Encarna is a compact woman with a taste for simplicity. She favours well-cut black clothing and bold pieces of jewellery. Her complexion is the colour of toast but the texture of velvet. When I look up, she turns her face to me, a puzzled smile tracing across it. It’s as if she’s tossed me a ball, so lightly, so casually. I’ve caught the ball but the ball has turned out to be surprisingly heavy. I see now that she understands I don’t know how to play this game; that few people know how to play this game with her: The game of unexpected gravity. She is an expert at living; I’m an amateur. by cpifinancial.net - The audience was addressed by HE Riad Salameh, Governor of the Banque Du Liban (Lebanese Central Bank) and HE Essa Kazim, Governor of DIFC. They highlighted how the banking sector is strategically important in both Lebanon and Dubai. It was emphasised that closer collaboration will help develop the industry further in the region and further afield. A number of Lebanese financial services institutions are already based in DIFC, a platform for them to grow beyond the region and to access international markets.“The DIFC is pleased to be hosting Banque Du Liban for today’s event which brings together people who are committed to developing the Banking sectors in Lebanon, the region and South-South corridor. Lebanon’s banks and financial institutions have built a high level of credibility both in relation to levels of liquidity and industry standards they collectively uphold, at home and overseas. We look forward to welcoming new clients from across the Lebanese banking sector to DIFC, facilitating the development of their respective businesses and providing strategic access to key markets across the globe,” said Kazim. The ‘Lebanon Banks Day’ event hosted at DIFC is one of a number of events that support key industry sectors and add value to clients operating within the district.“We are delighted to attend today’s event hosted by DIFC. We are very proud of the performance of our country’s banking sector in recent times, both at home and abroad, and it is encouraging that the DIFC is aligned with our growth objectives, supporting the banking sector’s development in the UAE and beyond from a robust and secure base,” said Salameh.Salameh added that Banque du Liban shares DIFC’s core objectives and has a focus on safeguarding monetary and economic stability. He asked politicians to grant prisoners an amnesty aside from any political motives, he also called on Prime Minister Saad Hariri to prioritize Lebanon’s national interest. Meanwhile, a Lebanese security source confirmed that hundreds of detainees had indeed begun their strike and refused to receive their daily meals. The source told Asharq Al-Awsat newspaper that the number of prisoners participating in the strike reached 575 out of 600, 200 from Tripoli prison in the north, and about 60 others from Jezzine prison, south Lebanon. He added that prison administration began monitoring the prisoners and is following up on their medical situation. Prior to the strike, families of inmates blocked the roads and began protests to press for general amnesty at the beginning of the presidency of President Michel Aoun. by Daily Star Lebanon - BEIRUT: Prime Minister Saad Hariri said Friday that Arab banks should play a bigger role in the reconstruction drive in the region. “First, the size of the reconstruction processes in the Arab world requires more openness and cooperation between all Arab banking sectors and all Arab banks from all countries,” Hariri told participants in a conference on financing reconstruction in Arab states organized by the Union of Arab Banks. “Second, the size of the reconstruction processes requires us to join the global trend of activating partnerships between the public and private sectors, particularly the process of developing infrastructure as the pillar of any economic growth. This is not the first time a senior Lebanese or Arab official has called on banks to help in financing the reconstruction of Arab states that have witnessed wars and conflicts. “The forum’s title, ‘Financing Reconstruction – In the Aftermath of the Arab transformations,’ summarizes our vision of the future based on turning challenges into opportunities. “Today our Arab countries are witnessing crises and challenges on all political, security, economic and social levels,” Hariri added. Hariri shared with the participants Lebanon’s experience in rebuilding the country and the role of the banks in financing reconstruction projects. Could Lebanon’s FPM abandon its alliance with Hezbollah? Beirut: Lebanon could see a shifting of alliances as Lebanese President Michel Aoun’s Christian Free Patriotic Movement (FPM), which has traditionally been allied with the Shiite Amal and Hezbollah parties, may switch sides to an anti-Syrian alliance comprised of Hariri’s largely-Sunni Future movement and the Christian Lebanese Forces led by Samir Geagea. An FPM shift would essentially break the Amal-Hezbollah monopoly in parliament, something that the Shiite parties chief backers Iran and Syria, would dread. The potential realignment comes as FPM leader and foreign minister Jibran Bassil and Shiite Parliament Speaker Nabih Berri continue to lock horns over a new electoral law. Politicians have been debating revising the archaic 1960 voting law since 2005 and have yet to reach consensus. According to the 1960 voting law, parliament seats are allocated by religious sects which Lebanon’s most prominent Christian parties want to amend. They say the law marginalises Christian voters, because, in the winner-take-all model Muslim voters in predominantly Christian districts cast their ballots to candidates backed by lists dominated by non-Christian parties. Last month, President Michel Aoun made the unprecedented move to suspend parliament which was due to extend its term for third time since 2009. The move was hailed by Christians but slammed by Shiite politicians including Berri, who also is the Amal party chief. Powerful Shiite groups like the Iran-backed Hezbollah and Amal want proportional representation or the winner-takes-all system since that would give it potential control of parliament due to its large numbers. Aoun, who has angered Saudi Arabia over his pro-Hezbollah statements in recent months, is apparently ruffling feathers of politicians in his own allianceBerri considered Aoun’s recent remarks to visiting businessmen from Melbourne, Australia, when the president said “those who oppose Bassil’s formula are those who control their communities and do not want minorities represented in parliament”, as a slap in the face.Bassil, Aoun’s son-in-law, has led the charge in parliament and assumed his self-appointed role as the ‘defender of Christians’ in the country. How Has a TV Station Fire Inflamed Tensions in Lebanon?